Pine trees grow around the world. Close to 115 varieties thrive in various conditions. Dwarf varieties and towering giants all make up the family of Pinaceae. 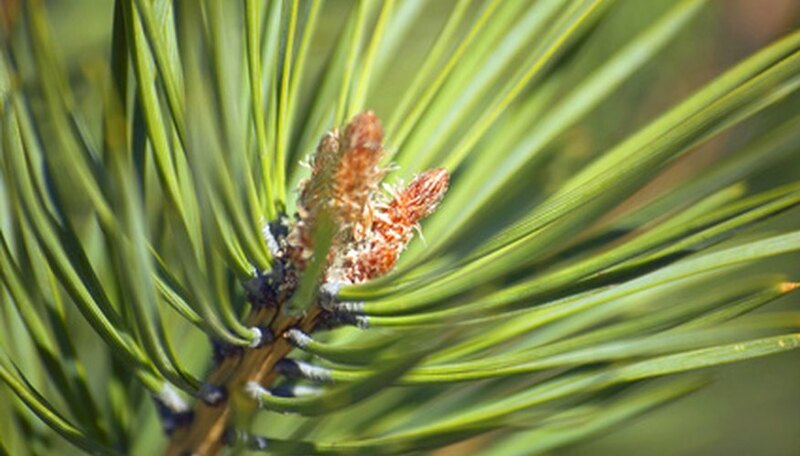 Pine trees fit into virtually every garden landscape with their year-round green needles and low maintenance. On occasion, a gardener may find himself faced with the task of transplanting a pine tree to a new location. The task is undertaken provided the tree is not too large to physically dig up and move. When transplanting a pine tree, remove as much of the root ball as possible to enable the tree to thrive in its new location. Transplant the pine tree in the early spring. The months of February, March and April offer the greatest chance of success because the tree is still dormant. Choose a new planting location that is sunny and offers well-drained soil. Dig a hole approximately 12 inches in diameter for every inch of tree trunk diameter. Dig the hole 6 inches deep for every inch of tree trunk diameter to offer the greatest chance of transplant success. A pine tree trunk that is 2 inches in diameter should be transplanted into a hole that is 24 inches wide by 12 inches deep. Mix a ratio of 50 percent peat moss, leaf debris or bark chips with 50 percent garden soil. Pine trees appreciate an abundant amount of organic material in the garden soil when being transplanted. Dig around the base of the pine tree gently. Dig at the same measurements that the transplant hole has been dug. Use a pitchfork to dig up the pine tree to lessen damage to the tree's root system. Gently insert the pitchfork into the soil and pry the tree up. Work your way around the tree, pushing the pitchfork deeper under the tree's root system. Reach down and grasp the pine trees trunk next to the soils surface and wiggle the tree free. Keep the rootball of the pine tree intact while moving the tree to its new location. Gently place the pine tree into its new hole and begin pushing the organic matter and garden soil around the rootball of the tree. Firm the soil down around the base. Remove any airpockets between the garden soil and the tree's root system. An airpocket will dry out the tree's roots. Water the pine tree thoroughly. Keep the transplanted pine tree moist but not waterlogged while it establishes itself in its new location. Add 3 to 4 inches of mulch around the base of the newly transplanted pine tree. The mulch will keep out weed growth and help the soil retain moisture in the heat of summer. A pine tree can take up to two to three years before fully established in its new location.